Overlooking a sandy beach this recently-renovated hotel combines traditional Greek hospitality with good facilities and comfortable accommodation, and is a good choice for those seeking a beach-based holiday. We stayed at this hotel the last week in June. The hotel was clean & staff were very nice. The rooms were a good size and very clean, we stayed in the main hotel building on the second (top) floor. There was a lot of noise in the hotel from children running about from one room to another. I did complain about this to reception who were brilliant an asked me to report it to them again when it was happening and they would speak to the parents asking them to take control. Although the rooms were nice, the walls were very thin and you could hear everything that was going on in both the rooms next to you and below us as well. You could clearly hear the conversations. The pool are is right on the beach front, just down a few steps. Friends suggested this hotel. We visited it twice in 2003, when I was pregnant and again in 2004. During our first stay we were in the hotel building. Two small but cosy rooms seperated by a bathroom. I liked the bungalow better. Much bigger rooms with a big terrace. We stayed there with the baby the following year. 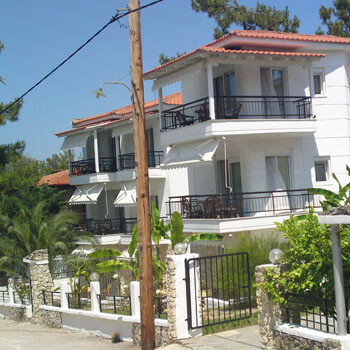 Close to the beach and pool, not having to walk a long distance, it is a really a lovely place for a family holiday. It was cleaned regularly, changing of towels and sheets every 3 days. The food is delicious but as mentioned on other reviews a bit similar every second night. The location is perfect, on the beach on one side and in the very center on the other. No entertainment but you don't really need it. The town is all around for you to experience. We tried finding a similar place to this to go this year but couldn't so we will be there again. We stayed at this hotel twice, in 2001 and 2002, (four times in Hanioti resort)so we obviously liked it. It is in excellent location, just on the beach and on the other side the entry to the hotel is next to the centre of town of Hanioti. The hotel is great for families with children (especially small children), since everything is near, the pool, the beach, the shopping facilities in town. The accomodation is very good considering the category (three star) and the price, although you do pay extra for the air-conditioning and fridge. There are rooms in the two main houses, but also a small number of bungallows which are scattered around in a beautiful garden and these are the ones to go for if you can get them. The pool is right next to the beach and is very clean with a small pool for children, also a playground in the shade nearby. The food is tasty (buffet for breakfast and dinner)but a bit monotonous. A bed/breakfast option would be best since there is a large number of quality restaurants in town (only a few hundred meters away) if you want to get the best taste of the Greek food. The entertainment is almost absent but again, the town in so near that you do not need hotel entertainment. The resort itself is excellent if you have kids, as it`s centre is closed for cars in the evening hours, so you can let the kids wander free. Some 50 meters from the hotel along the beach there is a most beautiful and well maintained park (something like this in rarely seen in Greece)where you can lie on the grass beneath the tall pine trees during the hottest hours of the day. It is useful to rent a car or a motorbike and visit neighbouring towns which are a couple of kilometeres away as well as some lovely beaches along the Kassandra peninsula coast.